“The book of Esther is… full of questions that preoccupy modern man: sexism, feminism, racism, genocide,” Arnold writes. 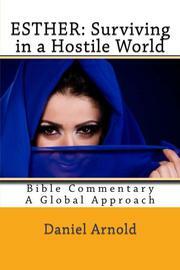 “Is it a model for feminists and oppressed minorities….Is Esther an example to follow?” To pursue this question, he conducts extensive analyses of the book of Esther as a literary work, a historical document, a biblical text, and, most important for his primary arguments, as a “hidden message” about the nature of God’s intervention in the lives of believers. Being different in structure, tone, and subject than any other book of the Bible, Esther lends itself well to this thorough study and allows Arnold (Esther: Forerunner of Jesus Christ, 2015, etc.) to investigate biblical translations, the origin of Purim, and Esther’s place in the historical record. His introduction sets out to show how Esther is affected by drama, intrigue, irony, and especially rhythm—Arnold makes particularly fascinating points about the book’s structure, likening it to varying heartbeats that follow “a crescendo, then a decrease,” in both chapter length and the temporality of the story. In his view, while the book of Esther opens itself to feminist or even post-colonial readings, these elements merely strengthen the text’s messages for believers. “The other questions are peripheral and are only of interest insofar as they convey the author’s message,” he writes, leaving many of those ideas in the footnotes and perhaps missing opportunities to engage with secular interpretations. But for Christian scholars and teachers of the Bible, Arnold acknowledges the inherent difficulties of Esther, namely that it is too long a narrative to easily use in a sermon and that God is never directly mentioned. For that reason, Arnold’s persistent emphasis on tying each piece of analysis to a Christian understanding of the work may become quite useful, especially in his extensive commentary, which breaks down the book of Esther verse by verse, calling on previous research and other biblical texts to further dissect the story for believers.